Among the tributes to Representative John Lewis during the Morning Exercises was the choir’s performance of “We Are…,” by Ysaÿe Maria Barnwell, who was a member of the African-American ensemble Sweet Honey in the Rock from 1979 to 2013. Lewis, LL.D. 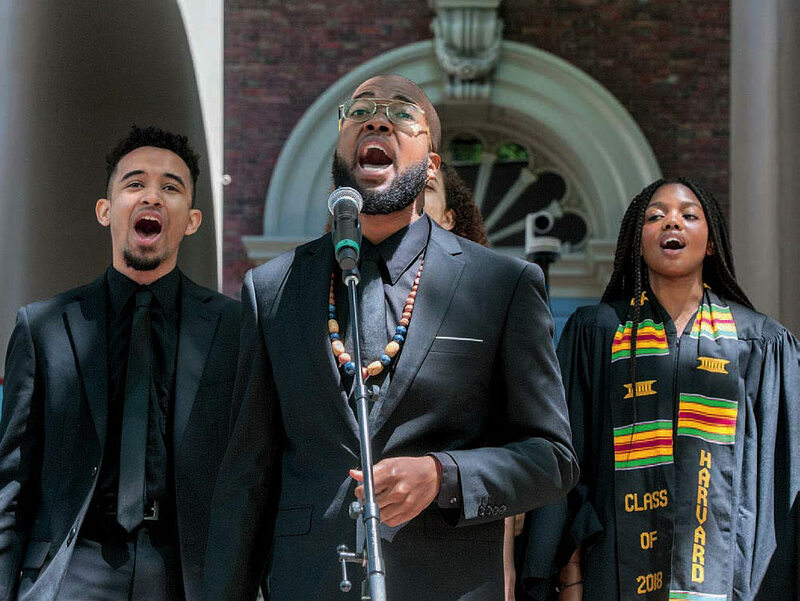 ’12, already had an honorary degree, but President Drew Faust hailed him late in the ceremony, and then College students performed an especially apt song, “Sing Out/March On,” led by its composer, Joshuah Brian Campbell ’16, front and center above. …at least among loquacious Crimson graduates. The Harvard and Radcliffe class of 1968 report totals a record-setting 1,223 text pages (1,380 overall, counting the enormous photo insert): allot 2¾ inches of shelf space. Perhaps it was the temper of that special year? President Drew Faust notes, in a special greeting, “There were no halcyon undergraduate days for those of us who graduated in 1968” (she from Bryn Mawr), and recalls the period from Tonkin Gulf to the assassinations that spring (Martin Luther King Jr., Robert F. Kennedy ’48). “In 1968,” she wrote, “the odds of my becoming the president of Harvard University and Bob Dylan’s being awarded the Nobel Prize in Literature were approximately the same.” Some things are worth writing about. The Alumni Association added an eleventh spring class report this year, for the seventieth-reunion class of 1948. A similar book will be added to the annual lineup from now on. Commencement admission tickets this year incorporated a QR code, a step, presumably, toward e-ticketing, perhaps for the 368th edition or a successor year—soon. Responding to Americans’ insatiable need for caffeine everywhere, coffee was made available for sale within the gates this year, at a cart near Boylston Hall run by Harvard Student Agencies. A cup of Dunkin’s finest went for $2.50, credit or debit card only—but was free with the purchase of a Harvard mug from the adjacent memorabilia booth. Apparently not even the School of Engineering and Applied Sciences’ geniuses have figured out yet how to install cup holders on Tercentenary Theatre’s close-quarters folding chairs. The Crimson’s senior survey (704 students responded) yielded results similar to those in recent years: 57 percent of respondents are headed for New York, Massachusetts, and California; 50 percent are bound for jobs in consulting, finance, and technology; accordingly, 53 percent of those headed for jobs expect first-year salaries of $70,000 or more. They are politically liberal; and although a majority view final clubs unfavorably, by 52 percent to 45 percent they view the recently imposed sanctions on joining such clubs unfavorably, too. A row in front of President Faust and Corporation members on the dais was former president Lawrence Summers—whose daughter, Ruth, was collecting her Ed.M. Also present for the day were Neil and Angelica Rudenstine, making for a robust presidential force field to honor the concluding administration and boost the new one. Among the fiftieth-reunion-goers was Gordon McKay professor of computer science Harry R. Lewis, Ph.D. ’74, who has been on the faculty for most of the time since then, preceding the dawning of the field that he has helped pioneer here. Lewis has also served as Harvard College dean and acting dean of the School of Engineering and Applied Sciences. His wife, Marlyn McGrath ’70, Ph.D. ’78, is nearing a similar milestone reunion—and has a similar record of service: as director of admissions since 1987, she has seen a lot of those students who ended up in Harry’s classes. Among them, he noted on his blog this spring, were 11 current faculty members, in fields from business to computer science to Egyptology. Graduate School of Education degree candidates typically wave paperback picture books in Tercentenary Theatre. Their departing dean, James Ryan, bound for the University of Virginia presidency, tucked his degrees script into a copy of Where the Wild Things Are—and his charges behaved with appropriate abandon. Appropriately enough, in the year when Harvard conferred an honorary degree on Twyla Tharp , the multitalented Madelyn Ho ’08, of the Paul Taylor Dance Company , received her medical degree. She celebrates, in Longwood, as presumably only she can. Members of the Radcliffe class of 1963 revealed some suppressed truths in their reunion survey. Eight recounted having been sexually assaulted: “In my first job, when I was working alone the prof would come in and put his hand down my blouse. I was young, shy, and too much in awe of him to do anything about it.” “One of my professors ‘behaved inappropriately’ to me. I reported his action to my head resident, who told me it was ‘better not to talk about it’ because he was coming up for tenure.” In a year of heightened awareness, when some graduates wore a #timesupharvard sticker to urge more responsive actions, their predecessors’ testimonies echoed painfully. Provost Alan Garber, as the morning emcee, was obliged to play it straight, to keep the train running on time. But he did don shades when he reached the honorands—not because it was sunny, but in homage to the signature fashion statement of film director Wong Kar Wai. And when it was Harvey V. Fineberg’s turn , Garber made much of the honorand’s prior service in the “exalted academic leadership position” of University provost—Fineberg’s role from 1997 to 2001. The exalted Fineberg exults upon collecting his fifth Harvard degree.